Spas by Design is the innovator and industry leader of the in-ground acrylic spa. With creative and elegant in-ground spa surrounds, we have mastered the art of naturally blending our therapy spa into any new or existing environment. Using the highest quality materials and our experienced and passionate team members, we create a separate destination in your backyard that will enhance your backyard while creating a feeling of relaxation and comfort. Our passion is providing our customers with a beautiful built in spa that is just as exciting to look at, as it is to soak in. 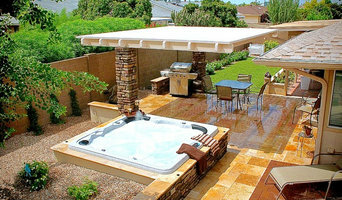 Palo Verde Pools has over 25 years of experience building custom pools, spas and hardscapes in the Valley. We have the knowledge and expertise to handle any project you can dream up. We provide exceptional service and craftsmanship through every stage of the process from design to construction. War are not an over sized production pool builder that can lose sight of a customer and their needs. Every client is important to us and their satisfaction is the key to our success in the future. Call us today for a free no obligation consultation to make your backyard vision a reality. Palo Verde is committed to serving our clients with a dedication to enhancing the quality of their outdoor living experience. We are a family owned and operated full service design, construction and consulting firm specializing in complete backyard environments. With over 21 years in the Arizona swimming pool industry we have the knowledge and experience to handle all projects from basic to complex. PAY NO MONEY UNTIL YOUR ENTIRE POOL OR LANDSCAPE PROJECT IS 100% COMPLETE AND YOU ARE SATISFIED! Arizona Rainfall Pools & Spas is proud to be the ONLY pool builder in the state of Arizona who CAN and WILL complete your entire backyard oasis from start to finish before taking any money. With over 38 of experience in the landscape design and pool/spa industry, we are the masters of exceeding customers expectations by delivering your project ON TIME, ON BUDGET, and ONE OF A KIND. You'll be swimming, barbecuing, and soaking in the sun before you've even paid a PENNY! Call us today or visit us online as www.azrainfall.com. We promise, “You’ll tell others how good we are." 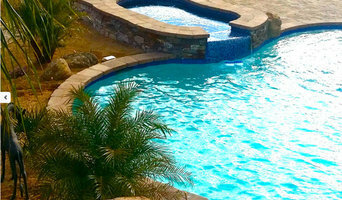 Northwest Valley Pool Specialists provides full service maintenance and repair of your pool and spa. From weekly pool service and equipment repair to smart phone automation, I can provide everything your swimming pool will ever need. Protect your investment and allow me to apply my expertise so you can enjoy your pool & spa without hassle!! Certified by APS and SRP to install and calibrate new variable speed pool pumps...you receive their rebate at point of sale! Turn your traditional backyard into something to enjoy and share with family and friends. Tribal Waters can create an attractive and functional pool that will turn your existing backyard lawn or patio into a pleasure-filled escape. Choose your detailed pool from a variety of exciting shapes and sizes or create your own that allows you to construct an environment that will afford you a private refuge for relaxing or outdoor entertaining. tribal Waters takes pride in ensuring that every customer is satisfied with their pool or spa. With no complaints from the Better Business Bureau and the Arizona Registry of Contractors, you can be assured that your happiness will be our #1 concern. 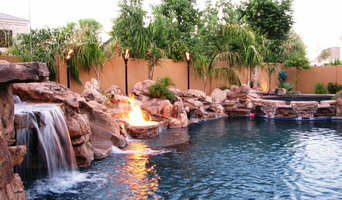 For complete customer satisfaction, choose Tribal Waters as your custom pool builder in Phoenix, Arizona. We cover all aspects of swimming pool/spa design, construction, service and repair. We also provide full service landscape and masonry design and install. Monster Pool Company focuses on the entire backyard experience rather than just a single element of your home. Arizona's Low-Price leader in Quality Pool Construction. We offer highly upgraded package pools, and custom pools at the best price, because we don't operate a show-room on a major Blvd. We pass the savings on to our customer. You get honest and easy to understand answers and no high pressure sales tricks or gimmicks. Just honest answers to help you design your pool and choose the right options for your family. Give us a call, your backyard is a canvas, let's turn it into a masterpiece. Middy Pools is a team of highly qualified women committed to excellence in backyard design and construction with more than 25 years of experience. We take pride in listening to you so that we can best understand how to meet your goals. DCS Pool Barriers, LLC offers a complete range of products to meet all your swimming pool barrier safety needs. We are your one-stop-shop to meet your Arizona pool fence, gate and door safety requirements. Our mission at DCS Pool Barriers is to provide the highest level of customer satisfaction through our quality products and highly trained and experienced installers. We will help you pass all of your standards of safety and Arizona State and City ordinances for pool barrier requirements. We manufacture our own entire line of products including swimming pool safety fences and gates, wrought iron gates and fencing. We control every part of the manufacturing process to ensure you receive a quality product and to keep prices reasonable. Made in the USA. Our Number one priority at DCS Pool Barriers is to provide quality pool safety products that offer additional levels of protection to supervision. At Specialty Pools We’re proud to provide Arizona businesses and residences with the ability to get everything they want in an outdoor environment. From design and construction to remodels and repairs, if you’re ready for the pool you want, without compromise, we’re ready to deliver it. Get savings without compromise! Call us today! When you need a pool and landscape custom designed and built to fit your property, there is no better team to call than our experts at Bravado Pools & Landscape. We work diligently with you through every step of the process, ensuring that your specifications are included and executed exactly to your liking, with one of a kind end results that you’ll love for years to come. From classic to the contemporary, our custom designed and built pools & landscapes are among the best in Phoenix. Trust our experienced team with your pool and landscape project – contact us today! At Bravado Pools & Landscape our team relentlessly pursues the highest standard of quality in every phase of the pool design and construction process. Our hard work and commitment to customer satisfaction is evident in our finished projects that we are proud of and you are eager to show off enjoy with family and friends. Emerald Pools & Spas Inc.